Our condolences go to Mike ZS1FP for the sad passing of Katherine, Mike's YL. 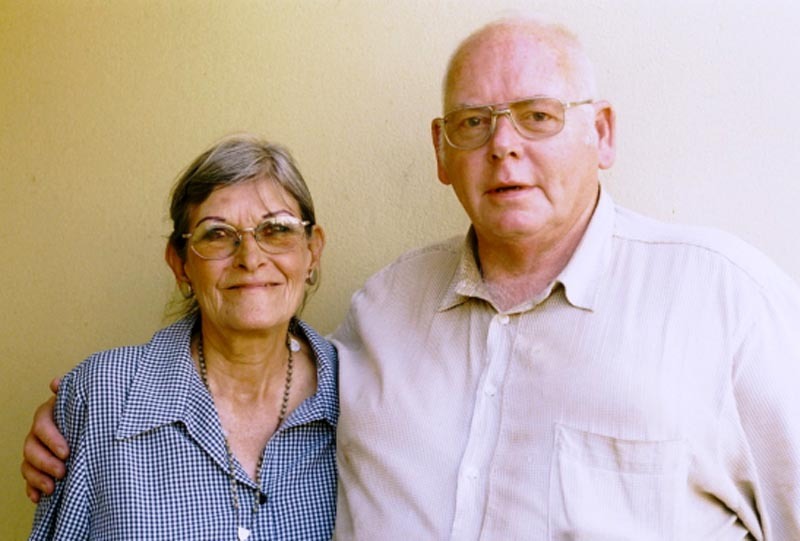 Katherine passed away in May. Some of us met Katherine at a CTARC function we held at the Observatory a couple of years ago. Our thoughts are with you, Mike. Chairman Rob ZS1SA opened the meeting with a welcome, and gave a report back on the recent committee meeting. He reminded us of the club’s AGM next month, and the August meeting which will be the International Lighthouse/Lightship Weekend held at Green Point Light on the weekend of 18/19 July 2018. Rob announced that John ZS1EQ is going to assist increasingly with managing our club’s ILLW involvement (a big task that Rob has carried with Spartan fortitude for the past eight years). Also, we have two new bulletin readers joining our team in the persons of John ZS1EQ and Chris ZS1CDG. Next, we were given the opportunity to see a very interesting piece of gear before the main talk. It was a Special Operations Executive spy transceiver of the type issued to SOE agents inserted into Axis-occupied France, Belgium, the Netherlands and the Balkans in the dark days of the Second World War. This compact W/T transceiver fits into a small leather suitcase. It was the smallest transceiver used in anger by the Allied forces at the time. 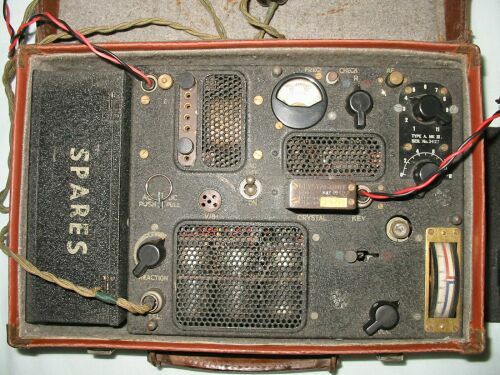 It was manufactured by Marconi in 1943, and is referred to as a Type 21 Mark iii, or Type "A" Mk iii, or simply "A3" suitcase radio). Solidly assembled and using just five valves – a 7Q7, three 7H7’s and a 7C5, this compact set was a vast improvement on its predecessor, the Mark ii (also called the "B2"), which had occupied three bulky boxes and would have been difficult for an agent (trying to avoid the enemy search teams) to transport discreetly. The Mark iii fits into a little suitcase just 13 x 9 x 4 inches in size. It is a CW transceiver (which can also receive A3 telephony), capable of operating between 3.2 and 9.55 MHz (sorry - Megacycles! ), the transmitter frequency being controlled by a crystal and the receive frequency operating in split mode (for better security and to avoid jamming). Typically,. three crystals were issued per set – one for the daytime frequency, a night time one and one for emergencies. The receiver is a reaction-tuned super-regenerative type with an Intermediate Frequency of 1200 kc/s. 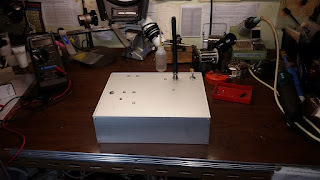 The rig pushes out just 5 watts, which is not that much considering the antenna and counterpoise were often set up just inside a single room to avoid visual detection. 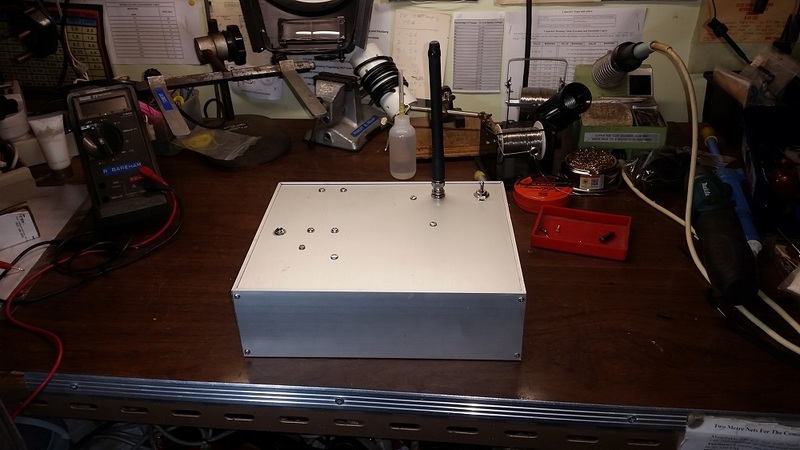 However, the home stations back on British soil would be copying the fugitive signal via a rhombic antenna connected to an HRO or AR88 communications receiver. Under ionospheric conditions at the time, ranges of 500 miles were possible. Also, this was surely one situation where “less is more” on account of a very diligent enemy with direction-finding equipment, highly motivated to find the clandestine transmitter soon after it came alive. 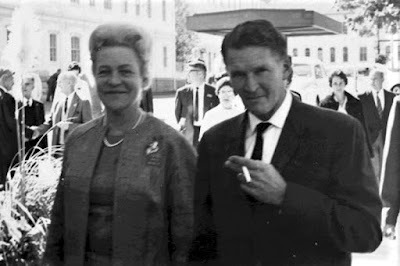 There is a vast amount of information on the Internet about the Special Operations Executive, their agents' training, missions, successes and failures through the war years. In addition to the European mainland operations, SOE was also active in the Balkans, the Middle East and the Far East as well. It makes for riveting reading. An interesting feature of this set is a switch with a ring-pull attachment. This switches the set instantly from mains to 6V battery power (it can be powered by both). This was because it was common practise for the hunters to first DF the approximate location of the transmitter, then to switch off the mains power area by area, block by block. Should the transmitter suddenly drop out as mains power was cut, that indicated the approximate block, street or building of its location, which would then be cordoned off and searched. The ring pull switch enabled the transmitter to keep on going – not so much as to complete the message (which could always be completed on a fall-back frequency and schedule) , but to try to fool the hunters as to its location. Peter has ably taken on the enormous task of documenting all the physical assets in our club. 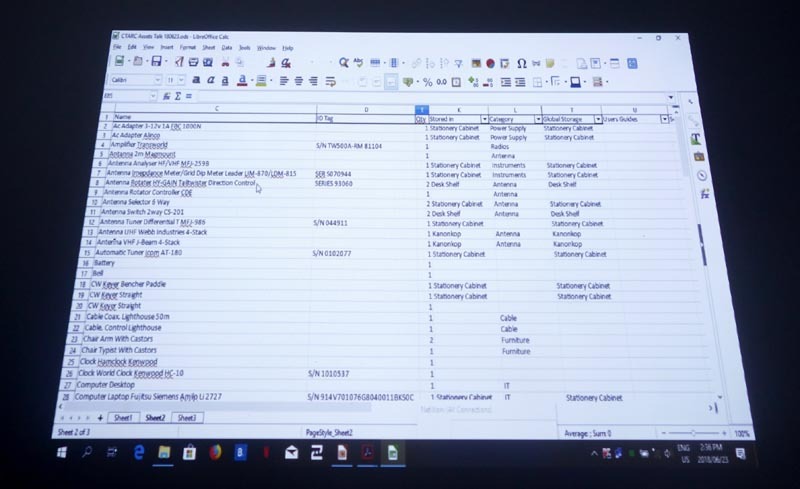 There are a number of reasons for doing this; not just to list everything so we know what we have, but also to know where to find it, to keep records of service, maintenance and performance (very useful in terms of recording antenna SWR, for example), to know the purchase and replacement values for insurance purposes, and to have easy access to the essential manuals and documentation. 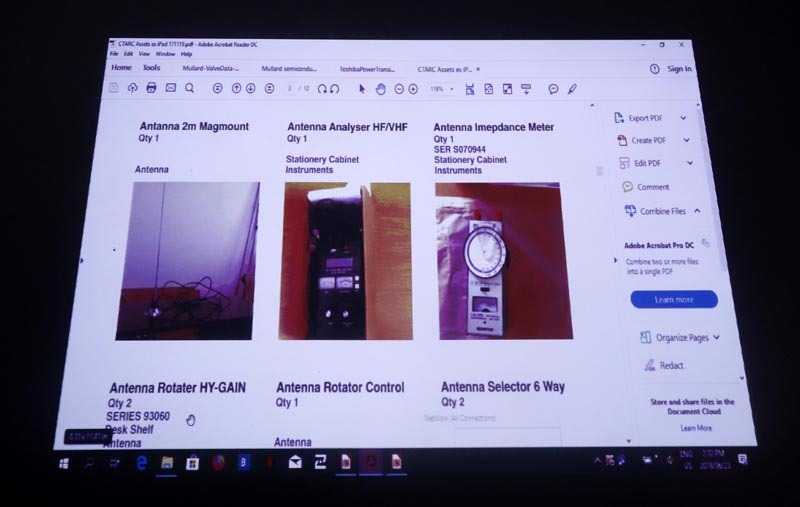 After initial technical gremlins, Peter started his presentation with a brief description of component nomenclatures through the history of electronics, looking at that for valves, semiconductor (with Mullard, Toshiba and JEDEC protocols), and even geographic location systems. The point being made that standardisation is very helpful and in the vast complexity of electronic systems and protocols, the absence of a consistent system leads to chaos. • It should be expandable. Peter has, in fact, already set up a very effective parallel system on his iPad, complete with photos of each item. But that breaks the “particular operating system” proscription, because not all of us have iPads! So instead he decided to implement the record system using Libre Office. This freeware set of applications, which includes Word Processing, Spreadsheet, Database, Presentation, Draw and Project Management capabilities, can also read and write Microsoft Office files, which is very useful. He showed us the above info, applied to a simple spreadsheet, which appears to work just fine. A further advantage is that hyperlinks can be added to individual spreadsheet cells, which can provide links to - well, anything else required. In this context, those local hyperlinks point to a picture of the item, and to the manual for that piece of equipment (where applicable). But when you think of it, you could, in the fullness of time, link to all sorts of relevant information. Should internet access become available, the range could be extended even further. Then it was time for a little wizardry. 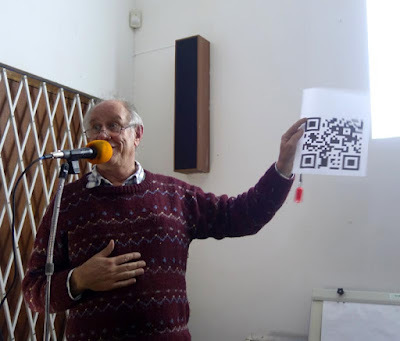 Peter showed us what he is doing with QR codes. These square “bar code” images can be generated on easily obtainable freeware such as Zint Barcode Studio (currently version 2v4). The QR code format can accommodate quite a lot of text information per item. Astonishment was expressed when people at the back of the venue discovered their smartphones could pick up and read QR codes held up (in low light) at the front of the room. So the idea is to incorporate the basic information for each item and affix a QR code for same on each item. Peter concluded the talk by answering several questions from the audience. Then Noel closed the meeting formally (Rob had to depart shortly after introducing Peter) and we started stacking chairs and perusing the swops on display. Paul ZS1S had generously provided boxes of Stuff for folk to take as needed, and several happy hams walked off with some free earthing leads and mains power cables. Post-meeting ragchews continued for a bit before we closed up shop and headed home. A most interesting afternoon indeed. • Take part in our weekly Monday evening natter at 20h00 on the 145.750 MHz repeater. We do look forward to seeing you all at our next meeting in July. The June CTARC meeting will take place on Saturday 23 June 2018 at 14h00, as usual at the clubhouse. 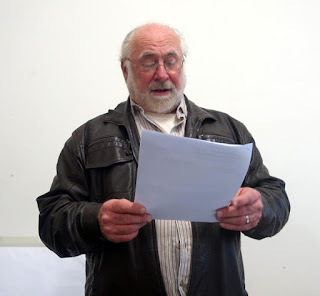 At this meeting, committee member Peter ZS1PGC will give a talk on Asset Management of our club's various rigs and assorted bits and pieces, using the Libra Office freeware application. With his engineering background, Peter is a very organised man. He is systematically itemising everything the CTARC possesses and has already demonstrated to the CTARC committee his thorough and creative approach to completing this gargantuan task. Those fortunate enough to have attended his fascinating talk in 2016 on his RigExpert Antenna Analyser will know that he delivers his presentations with infectious enthusiasm. 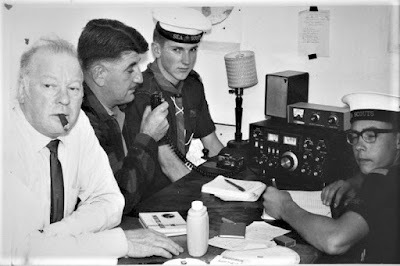 So the June meeting promises to be a good one, full of useful information on how to organise your own radio ham (and other kinds of) possessions. Come early to ensure your seat. Note: This meeting has now taken place. Read the report here. There will be NO increase in subs for 2018 / 19; they remain at R150-00 per Member, and R120-00 for Pensioners (over 65 years of age). 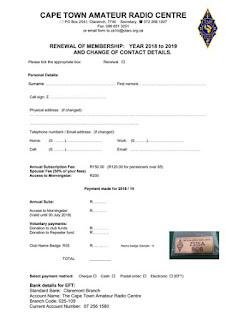 The Renewal Form is attached [here] with all the information you need including banking details and this is your reminder to pay your 2018/2019 subs as soon as possible. Please remember, to send me proof of payment with some means of identifying that it is you how have paid (e.g. Name Callsign). CTARC subs are due each year on 30 June, and to those members who have not let us know their intention to renew on or before the AGM, we will have to assume you wish to be removed from the membership and mailing lists. Most important: If your contact details have changed, then please also update them on the Renewal Form attached and email it to me. If your contact details have not changed, you needn't e-mail it to me. This way we can ensure members continue to receive notifications and editions of Ragchew by e-mail. Also available to members is our kilowatt remote base station at Morningstar. If you would like use Morningstar and have not already subscribed, then kindly add an additional R200-00 to your membership subs which will be used toward the site rental costs at Morningstar. Once I receive your proof of payment, I will add your name to the list and you will be given access to Morningstar until 30 June 2019. If you require setup instructions for the use of Morningstar, please request this information in your e-mail to me at the same time. The Club is once again growing, with many new members having joined us this past year. At the time of writing this e-mail we are only two away from the magical 100th member! The Club has many exciting and different events planned for the upcoming year, so please don't miss out - renew your membership now. I will see you all on Saturday, 28 July 2018 at the AGM where you can enjoy some delicious refreshments and socialise with your friends and fellow Amateurs for a while. This unique and truly ingenious device exhibits the characteristically flawless metalwork signature of Rob ZS1SA and (when opened) the deftly intricate hand-wiring skills of Chris ZS1CDG within. It is, in fact, a Fox. Observe it closely, for ere long it shall be, suitably camouflaged, secreted at a hidden location known only to a very select inner circle, and then activated to emit a tantalisingly fugitive signal periodically. At this point, teams of trained operatives, bearing a variety of directional antennae that bear resemblance to vandalised tape-measures, egg-beaters and ray guns, will endeavor to discover its secret location by way of the dark arts of radiolocation and direction finding. Should you wish to participate in this activity, further instructions will be posted here in due course. CTARC Committee embers are reminded of the forthcoming meeting at 19h00 on Monday 18 June 2018 at the clubhouse. Please make an effort to attend as there are important matters to discuss regarding the July Meeting. Please note this meeting has now taken place. 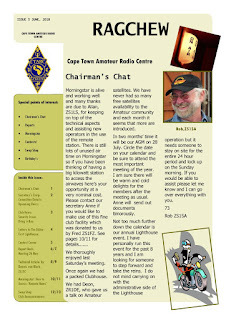 CTARC chairman Rob ZS1SA will report back at the June meeting. An employment opportunity has become available recently. An Installer Technician is needed by two-way radio company based in the Northern Suburbs of Cape Town. If you have the above proficiencies/experience and are interested in joining the team, please e-mail your CV to jobs@itecape.com. 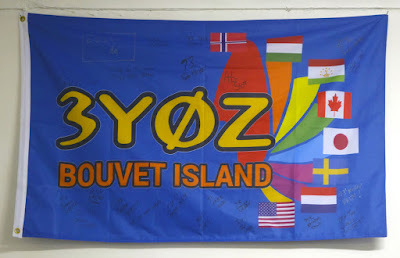 When the 3Y0Z DxPedition to Bouvet Island was abruptly cancelled, the Cape Town Amateur Radio Centre came to the rescue and formed a welcoming committee (organised chiefly by Paul ZS1S, as well as a number of other local and regional radio hams) to greet the weary travelers who had made it up from Bouvet Island after a rather bumpy ride through the roaring forties. They were assisted with their disembarcation at Cape Town, with logistics and with a combined welcome and farewell function at the Royal Cape Yacht Club, and later with lifts to the airport as well. Read about that (here). The 3Y0Z group were so grateful for their warm welcome that they donated their DxPedition colours to the Cape Town Amateur Radio Centre. 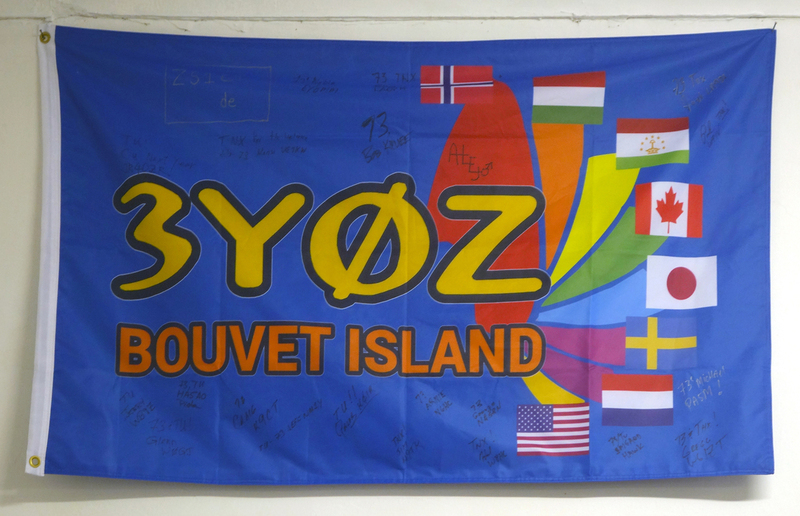 So we display them proudly in our clubhouse, for although we did not take physically part in their journey to Bouvet Island, we were very much with them on air and in spirit, and we share the fellowship and fraternity with that great team and with the greater Amateur Radio community. Here's another photo, kindly provided by Dennis ZS1AU. At a JOTA-type outreach activity are, L to R. Ted Baker ZS1RA (former Cape Town Branch chairman) and Sydney Smith ZS1PF at the microphone, along with two avid Lakeside Sea Scouts. Here is some club history, kindly provided by Dennis ZS1AU. In the photo (right) from (we guess) the 1960's, L to R: Sydney Smith ZS1PF standing, telling us about his homebrew project (it was an electronic keyer), Ray Alexander ZS1IM (then CT Club Chairman) & Jack Meerburg ZS1FM (Secretary) seated. Note the Trophies! 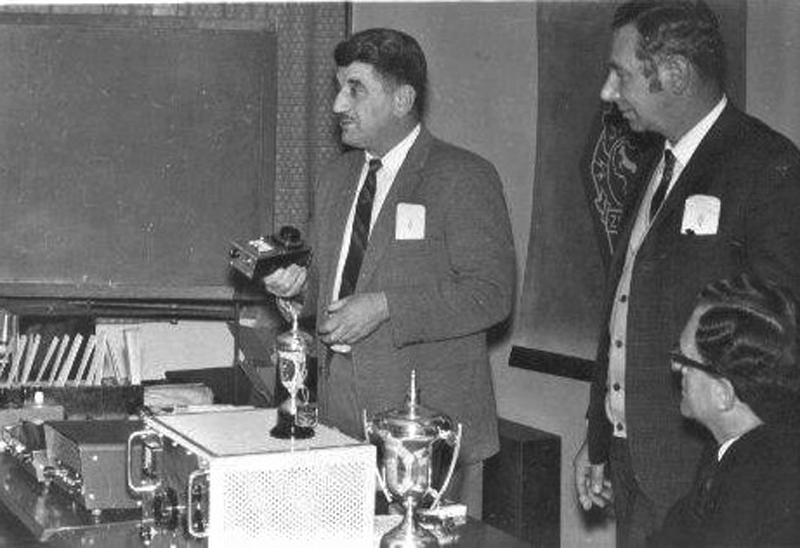 Syd, who was a Mechanical Engineer by profession and who built beautiful homebrew equipment, was the winner in the photo. He also built (for his company, Cape Steel Pty Ltd ) the connecting bridge walk through, over Darling Street, from Cape Town Railway Station to the OK Bazaars/Golden Acre complex. Sadly, both Syd and Ray have since passed on, but Jack is still around and living in Constantia. In the photo (right) are Muriel Alexander (Ray's XYL) and Mac Mclure ZS1VN. 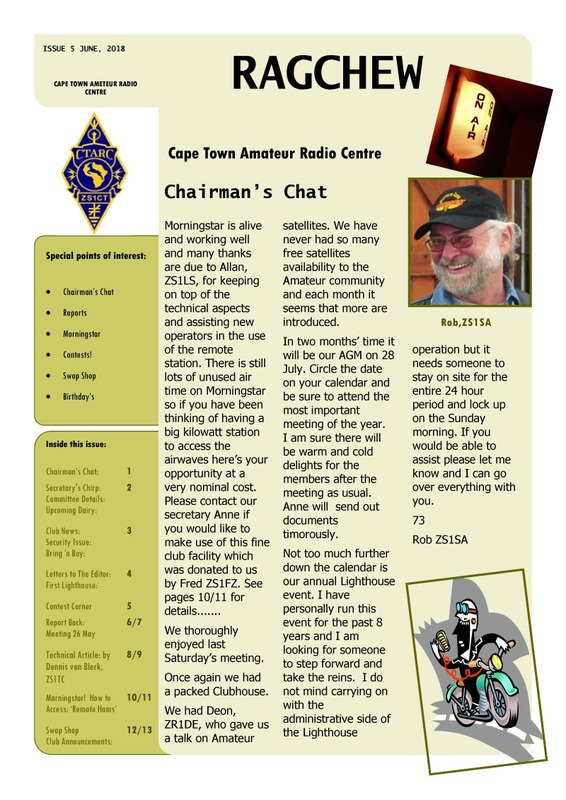 The June 2018 edition of the Cape Town Amateur Radio Centre's bi-monthly newsletter "Ragchew" is now published.